Richard Freed of The Audio Beat reviewed the Paradigm SHIFT E3m and concluded that "it has an agreeably musical character that will appeal to more than a few listeners." We were pleased to read all of the details that Richard went into when testing out the E3ms and although we have mentioned some highlights below, we encourage you to read the full review. "The E3m looks good... understated elegance." "The E3m looks good. Its attractive design seems to be an indication of solidity and seriousness of purpose, and an encouragement of high expectations. There is nothing radical about it, but nothing really ordinary either. It's available in either black or white. The black option, which I received, contrasts with the sleek-looking machined aluminum used for the 'buds and the grip for the connecting pin to create a further impression of understated elegance." 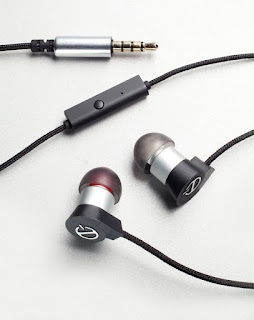 "The E3m comes with three pairs of tips -- small, medium and large... Although most IEM user guides tell us to go for a tight seal to ensure a rich bass response, I was pleased to see that Paradigm cautions, "Tips should fit snugly but not tightly." Too tight a seal can pump up the bass in such a way that the defining high frequencies are swamped on the low end, robbed of their clarity and definition, and bass becomes an amorphous sonic ooze instead of being an element of the music." "The burn-in proceeded impressively. After about 25 hours' use the E3m identified itself as something a good deal more than simply a good performer for the price; by 50 hours the reservation "for the price" more or less faded out of the picture; after 80 or 90 hours, it was simply a fine musical device that will appeal particularly to listeners who favor IEMs and are most comfortable with a rich, sumptuous low end, without sacrificing definition throughout the range." "Here the cymbals were delicately vivid, and the triangle... emerged from its cushion of orchestral texture with the slender, shimmering ping one hears from a good seat in a concert hall. The chorus too came through with fine naturalness." "... and the E3m upheld the familiar image of burnished gold, while the upsurge of the orchestra's entire low end... was given exceptional presence and body." "The E3m handled the beefy good humor of this episode with its kaleidoscopic details just beautifully." "Its declared objective of rich bass was realized without neglecting the rest of the tonal spectrum, and the nature of one's response to it is likely to be more in the nature of personal taste than an objective judgment of "right and wrong." In other words, beyond the E3m's native accuracy lies the realm of personal taste." "The bottom line here, though, is that the E3m more or less defines its own terms rather than meeting its established competitors head-on... The E3m is a genuinely musical device that does what it set out to do... to please almost anyone. It is comfortable for long stretches without physical or listening fatigue -- and if cost is a concern, it is clearly a standout at its modest price." Click here! to read the full review by the Audio Beat. Click here! for more information on the E3m or to buy online.